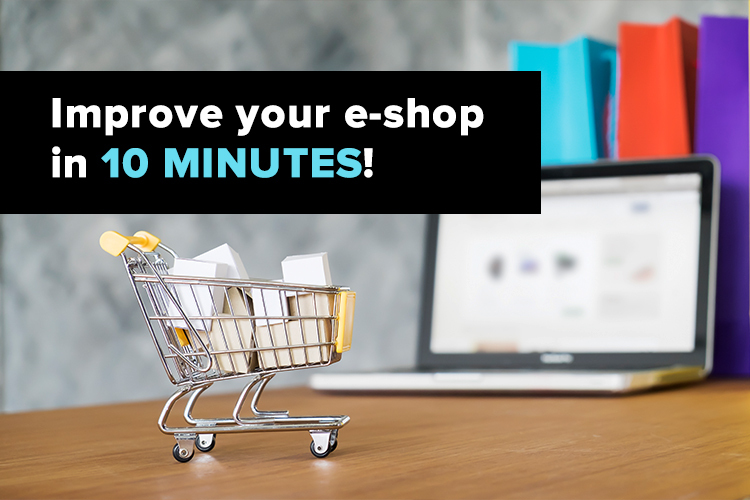 Improve your store in 10 minutes! When you run a business there are a million things to do and decisions to take every second. Since the bottom line is the main concern, we have prepared some actions that will take a couple of minutes to complete, but that will improve your store and grow your online profits. – 57% of users won’t recommend a business with a poorly designed mobile site. There are a lot of aspects to consider. Without having a mobile store, or a poorly functioning site, you are losing potential customers, creating a bad first impression and pushing them to your competitors. The bottom line is the fewer actions a customer has to do, the more you’ll benefit in the long term. What can you do? Run your website through Think with Google. It will test how quick and mobile friendly your store is and will give you actionable advice on what to improve. Is your e-shop as good as you think? You are proud of your products and your lifestyle photography represents your vision and brand perfectly. But can your customers actually use your site? From unclear product descriptions or difficulty finding the checkout button, to missed sales or offer opportunities, the insight of a complete stranger can be invaluable. What can you do? Sit with a user and watch them use your store, from landing page to checkout, and analyze their journey. You’ll gain invaluable insights into where you may be missing out on sales and find potential bugs. It is imperative your images display your product in the best light possible. In brick-and-mortar stores, customers can pick up, hold, feel, size and examine what they’re about to spend their money on. Good product photography can take you from second hand to a fashion week winner. And it doesn’t have to be an expensive investment. What can you do? Look at your photography in an unbiased light. Is it uncluttered, clear, well lit, from multiple angles, would you ultimately buy from your store? If not, consider reaching out to product photographers or reading up and ordering your own equipment and decide what is best for your brand looking forward. Feedback and communications from your customers can often offer insights into things you may have overlooked. Maybe your services or products aren’t clear, or the length or fit of a particular garment might not be apparent. Providing a forum, especially regarding delivery and returns advice, not only are you cutting down your query inbox but also showing a transparent business process. There are now chat apps that can offer an instant response. What can you do? Search through your communications with your customers, are there any recurring themes? If so, create a commonly asked questions blog or page using the responses you gave to customers. The more hoops you ask your customers to leap through, the greater the risk of cart abandonment. This is especially relevant for mobile customers, as entering delivery details and card detail on mobile can be challenging. Approximately 70% of your customers are one time only purchasers. By offering guest checkout you speed up the process and offer freedom to the speedy shopper. What can you do? Select a couple of items and purchase them from your store. Can you do it in under 3 minutes? If not, you should consider enabling the guest checkout option or limiting your checkout to one page. Emotional intelligence, for marketing success! Product photography: Your e-shop calling card! Time to get real about omnichannel marketing!